Encyclopaedia Britannica: Chicago, 1994; pp 138-155. 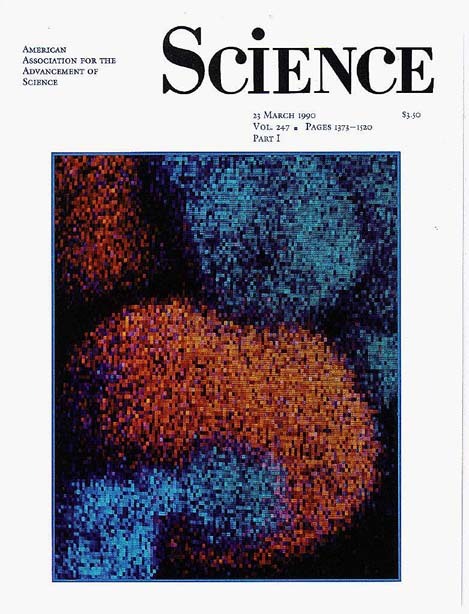 For a less technical account of our work, see "Sonochemistry" Chemistry, Summer 2000, pp. 3, 17-22. Chemistry is a free quarterly magazine published by the American Chemical Society and distributed to its more than 160,000 members and student affiliates. Ultrasound is simply sound pitched above human hearing. It has found many uses in many areas. At home, we use ultrasound for dog whistles, burglar alarms, and jewelry cleaners. In hospitals, doctors use ultrasound to remove kidney stones without surgery, to treat cartilage injuries (such as "tennis elbow"), and to image fetal development during pregnancy. In industry, ultrasound is important for emulsifying cosmetics and foods, welding plastics, cutting alloys, and large-scale cleaning. None of these applications, however, take advantage of the effects that ultrasound can have on chemical reactivity. The chemical applications of ultrasound, "sonochemistry", has become an exciting new field of research during the past decade. The history of sonochemistry, however, begins in the late 1800s. During field tests of the first high-speed torpedo boats in 1894, Sir John I. Thornycroft and Sydney W. Barnaby discovered severe vibrations from and rapid erosion of the ship's propeller. They observed the formation of large bubbles (or cavities) formed on the spinning propeller and postulated that the formation and collapse of these bubbles were the source of their problems. By increasing the propeller size and reducing its rate of rotation, they could minimize this difficulty of "cavitation". As ship speeds increased, however, this became a serious concern and the Royal Navy commissioned Lord Rayleigh to investigate. He confirmed that the effects were due to the enormous turbulence, heat, and pressure produced when cavitation bubbles imploded on the propeller surface. In the same work, he explained that cavitation was also the origin of teakettle noise! This phenomenon of cavitation occurs in liquids not only during turbulent flow but also under high-intensity ultrasonic irradiation. It is responsible for both propeller erosion and for the chemical consequences of ultrasound. Alfred L. Loomis noticed the first chemical effects of ultrasound in 1927, but the field of sonochemistry lay fallow for nearly 60 years. The renaissance of sonochemistry occurred in the 1980's, soon after the advent of inexpensive and reliable laboratory generators of high-intensity ultrasound. Scientists now know that the chemical effects of ultrasound are diverse and include substantial improvements in both stoichiometric and catalytic chemical reactions. In some cases, ultrasonic irradiation can increase reactivities by nearly a millionfold. The chemical effects of ultrasound fall into three areas: homogeneous sonochemistry of liquids, heterogeneous sonochemistry of liquid-liquid or liquid-solid systems, and sonocatalysis (which overlaps the first two). Because cavitation can take place only in liquids, chemical reactions do not generally occur during the ultrasonic irradiation of solids or solid-gas systems. Frontpiece.This micrograph shows interparticle collisions induced by ultrasound between tin and iron particles about 20 microns in size. The velocity of such collisions can be as high as 500 m/s (1100 mph). The elemental composition dot map was produced by scanning Auger electron spectroscopy and show tin in orange and iron in blue. 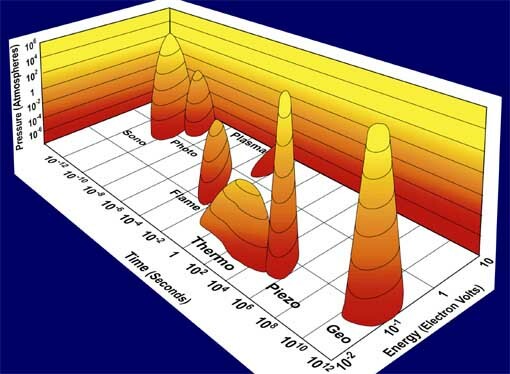 Ultrasonic irradiation differs from traditional energy sources (such as heat, light, or ionizing radiation) in duration, pressure, and energy per molecule (Figure 1). Because of the immense temperatures and pressures and the extraordinary heating and cooling rates generated by cavitation bubble collapse, ultrasound provides an unusual mechanism for generating high-energy chemistry. As in photochemistry, very large amounts of energy are introduced in a short period of time, but it is thermal rather than electronic excitation. High thermal temperatures are reached. Furthermore, sonochemistry has a high-pressure component, which suggests that it might be possible to produce on a microscopic scale the same large-scale conditions produced during explosions or by shock waves (a shock wave is a compressional wave formed whenever the speed of a body or fluid relative to a medium exceeds that at which the medium can transmit sound). Figure 1. Chemistry: the interaction of energy and matter. The three axes represent duration of the interaction, pressure, and energy per molecule. The labeled islands represent the nature of the interaction of energy and matter in various different kinds of chemistry. Sound is nothing more than waves of compression and expansion passing through gases, liquids or solids. We can sense these waves directly through our ears if they have frequencies from about Hertz to 16 kHz (the Hertz unit is cycles of compression or expansion per second; kiloHertz, abbreviated kHz, is thousands of cycles per second). These frequencies are similar to low frequency radio waves, but sound is intrinsically different from radio or other electromagnetic radiation. For example, electromagnetic radiation (radio waves, infrared, visible light, ultraviolet, x-rays, gamma rays) can pass through a vacuum without difficulty; on the other hand, sound cannot because the compression and expansion waves of sound must be contained in some form of matter. High intensity sound and ultrasound are generally produced in a similar fashion: electric energy is used to cause the motion of a solid surface, such as a speaker coil or a piezoelectric ceramic. Piezoelectric materials expand and contract when an electric field is applied. For ultrasound a high frequency alternating electric current is applied to a piezoelectric attached to the wall of a metal container (as in an ultrasonic cleaning bath of the kind used, for example, by jewelers) (Figure 2). Figure 2. Diagram shows a typical sonochemical apparatus. Ultrasound can easily be introduced into a chemical reaction in which there is good control of temperature and ambient atmosphere. The titanium rod shown immersed in the reaction liquid is driven into vibration by a piezoelectric, which vibrates when subjected to an alternating current electric field. The usual piezoelectric cerramic is PZT, a lead zirconate titanate material. Ultrasound has frequencies pitched above human hearing (above roughly 16 kHz). Scientists can make narrow beams of "silent" ultrasound far more intense than the roar of a jet engine, but completely unheard by our ears. Ultrasound has wavelengths between succession compression waves measuring roughly 10 cm to 10-3 centimeters. These are not comparable to molecular dimensions. Because of this mismatch, the chemical effects of ultrasound cannot result from a direct interaction of sound with molecular species. Nonetheless, the ultrasonic irradiation of liquids does produce a plethora of high energy chemical reactions. This occurs because ultrasound causes other physical phenomena in liquids that create the conditions necessary to drive chemical reactions. The most important of these is cavitation: the formation, growth, and implosive collapse of bubbles in a liquid. The dynamics of cavity growth and collapse are strikingly dependent on the local environment. Cavity collapse in a homogeneous liquid is very different from cavitation near a liquid-solid interface, which will be considered later. As ultrasound passes through a liquid, the expansion cycles exert negative pressure on the liquid, pulling the molecules away from one another. If the ultrasound is sufficiently intense, the expansion cycle can create cavities in the liquid. 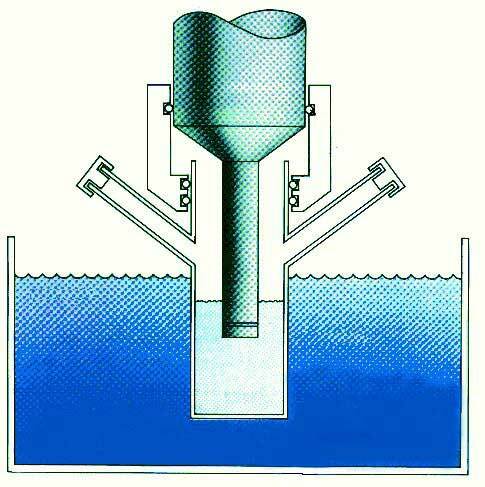 This will occur when the negative pressure exceeds the local tensile strength of the liquid, which varies according to the type and purity of liquid. (Tensile strength is the maximum stress that a material can withstand from a stretching load without tearing.) Normally, cavitation is a nucleated process; that is, it occurs at pre-existing weak points in the liquid, such as gas-filled crevices in suspended particulate matter or transient microbubbles from prior cavitation events. Most liquids are sufficiently contaminated by small particles that cavitation can be readily initiated at moderate negative pressures. Once formed, small gas bubbles irradiated with ultrasound will absorb energy from the sound waves and grow. Cavity growth depends on the intensity of the sound. At high intensities, a small cavity may grow rapidly through inertial effects. If cavity expansion is sufficiently rapid during the expansion half of a single cycle, it will not have time to recompress during the compression half of the acoustic cycle. At lower acoustic intensities cavity growth can also occur by a slower process called rectified diffusion (Figure 3). Under these conditions a cavity will oscillate in size over many expansion and compression cycles. During such oscillations the amount of gas or vapor that diffuses in or out of the cavity depends on the surface area, which is slightly larger during expansion than during compression. Cavity growth during each expansion is, therefore, slightly larger than shrinkage during the compression. Thus, over many acoustic cycles, the cavity will grow. The growing cavity can eventually reach a critical size where it can efficiently absorb energy from the ultrasonic irradiation. Called the resonant size, this critical size depends on the liquid and the frequency of sound; at 20 kHz, for example, it is roughly 170 micrometers. At this point the cavity can grow rapidly during a single cycle of sound. Figure 3. 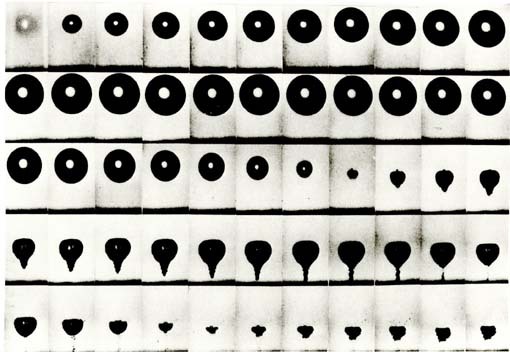 Liquids irradiated with ultrasound can produce bubbles. These bubbles oscillate, growing a little more during the expansion phase of the sound wave than they shrink during the compression phase. Under the proper conditions these bubbles can undergo a violent collapse, which generates very high pressures and temperatures. This process is called cavitation. Once the cavity has overgrown, either at high or low sonic intensities, it can no longer absorb energy as efficiently. Without the energy input the cavity can no longer sustain itself. The surrounding liquid rushes in, and the cavity implodes. It is the implosion of the cavity that creates an unusual environment for chemical reactions. Compression of a gas generates heat. On a macroscopic scale, one can feel this when pumping a bicycle tire; the mechanical energy of pumping is converted into heat as the tire is pressurized. The compression of cavities when they implode in irradiated liquids is so rapid than little heat can escape from the cavity during collapse. The surrounding liquid, however, is still cold and will quickly quench the heated cavity. Thus, one generates a short-lived, localized hot spot in an otherwise cold liquid. Such a hot spot is the source of homogeneous sonochemistry; it has a temperature of roughly 5000° C (9,000° F), a pressure of about 1000 atmospheres, a lifetime considerably less than a microsecond, and heating and cooling rates above 10 billion° C per second. For a rough comparison, these are, respectively, the temperature of the surface of the sun, the pressure at the bottom of the ocean, the lifetime of a lightning strike, and a million times faster cooling that a red hot iron rod plunged into water! Thus, cavitation serves as a means of concentrating the diffuse energy of sound into a chemically useful form. Alternative mechanisms involving electrical microdischarge have been proposed (most recently by M.A. Margulis of the Russian Institute for Organic Synthesis), but they do not appear fully consistent with observed data. Determination of the temperatures reached in a cavitating bubble has remained a difficult experimental problem. The transient nature of the cavitation event precludes direct measurement of the conditions generated during bubble collapse. Chemical reactions themselves, however, can be used to probe reaction conditions. The effective temperature of a system can be determined with the use of competing unimolecular reactions whose rate dependencies on temperature have already been measured. This technique of "comparative-rate chemical thermometry" was used by K.S. Suslick, D.A. Hammerton and R.E. Cline, Jr., at the University of Illinois to determine the effective temperature reached during cavity collapse. For a series of organometallic reactions, the relative sonochemical rates were measured. In combination with the known temperature behavior of these reactions, the conditions present during cavity collapse could then be determined. The effective temperature of these hot spots was 5,200 K. Of course, the comparative rate data represent only a composite temperature: during the collapse, the temperature has a highly dynamic profile, as well as a spatial gradient in the surrounding liquid. When a liquid is subjected to ultrasound, not only does chemistry occur, but light is also produced (Figure 4). Such "sonoluminescence" provides an alternate measure of the temperature of the high-energy species produced during cavitation. High-resolution sonoluminescence spectra were recently reported and analyzed by E.B. Flint and Suslick. From a comparison of synthetic to observed spectra, the effective cavitation temperature of the emitting species is 5,100 K. The agreement between this spectroscopic determination of the cavitation temperature and that made by comparative rate thermometry of sonochemical reactions is surprisingly close. Figure 4. High intensity ultrasound creates localized hot spots in liquids through the process of cavitation. Local heating produces excited states of molecules that emit light, just as they do in a flame. The image shown is such sonoluminescence seen from a vibrating titanium rod (about 0.4 inch) in diameter. False color is used to enhance contrast. The temperature created in cavitation hot-spots, determined from the spectrum of this emission, is ~5000 K.
When cavitation occurs in a liquid near a solid surface, the dynamics of cavity collapse changes dramatically. In pure liquids, the cavity remains spherical during collapse because its surroundings are uniform. Close to a solid boundary, however, cavity collapse is very asymmetric and generates high-speed jets of liquid (Figure 5). The potential energy of the expanded bubble is converted into kinetic energy of a liquid jet that moves through the bubble's interior and penetrates the opposite bubble wall. Werner Lauterborn at the Technische Hochschule in Darmstadt, Germany, observed liquid jets driving into the surface with velocities of roughly 400 kilometers/hour (Figure 6). These jets hit the surface with tremendous force. This process can cause severe damage at the point of impact and can produce newly exposed, highly reactive surfaces; it has great importance for understanding the corrosion and erosion of metals observed in propellers, turbines, and pumps where cavitation is a continual technological problem. Distortions of bubble collapse depend on a surface several times larger than the resonant size of the bubble. The presence of fine powders, therefore, does not induce jet formation. In the case of liquid-powder slurries, the shock waves created by homogeneous cavitation can create high-velocity interparticle collisions. The turbulent flow and shock waves produced by intense ultrasound can drive metal particles together at sufficiently high speeds to cause effective melting at the point of collision (Figure 7). Such interparticle collisions are capable of inducing striking changes in surface texture, composition, and reactivity, as discussed later. 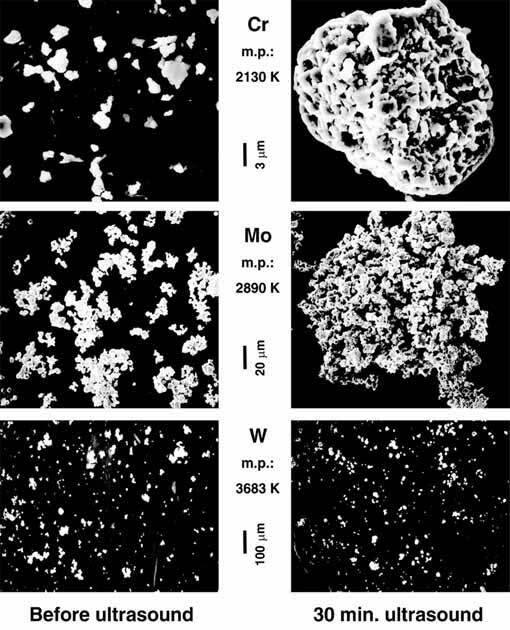 S. J. Doktycz and K. S. Suslick used metal powders to estimate the effective maximum temperatures and speeds reached during interparticle collisions (Figure 8). When chromium, molybdenum, and tungsten powders of a few micrometers in size are irradiated in decane at 20 kHz and 50 watts per square centimeter, one observes agglomeration and welding of particles for the first two metals but not for the third. 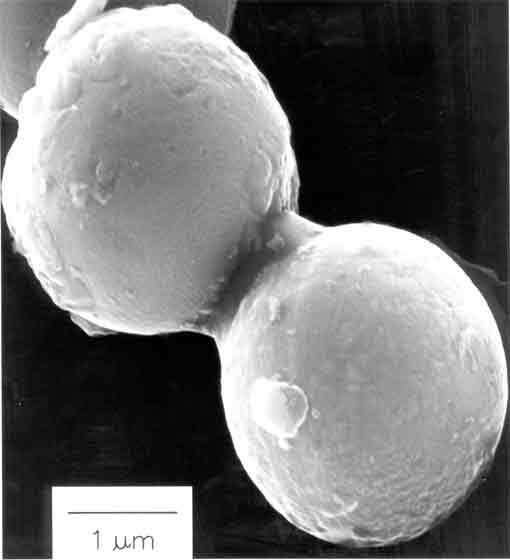 On the basis of the melting points of these metals, the effective transient temperature reached at the point of impact during interparticle collisions is roughly 3000° C. On the basis of the volume of the melted region of impact, the amount of energy generated during collision was determined. From this, the velocity of impact is estimated to be roughly 1800 kilometers per hour, which is half the speed of sound in liquids. It should be noted that the conditions reached during interparticle collisions are not directly related to the temperatures reached during cavitational collapse of bubbles. Figure 7. Scanning electron micrograph reveals zinc powder after ultrasonic irradiation. The neck formation from localized melting or plastic deformation was caused by high-velocity collisions of the zinc particles. Figure 8. Scanning electron micrographs reveal slurries of metal powders both before and after ultrasonic irradiation. Chromium has a melting point of 1857° C (3,374.6° F), and its particles both agglomerate and are deformed; molybdenum melts at 2617° C (4,742.6° F), and its particles are slightly agglomerated but not smoothed or deformed; tungsten melts at 3410° C (6,170° F) and is unaffected. High-intensity ultrasonic probes (10 to 500 watts per square centimeter) are the most reliable and effective sources for laboratory-scale sonochemistry. A typical laboratory apparatus permits easy control over ambient temperature and atmosphere (Figure 2). Lower acoustic intensities can often be used in liquid-solid heterogeneous systems because of the reduced liquid tensile strength at the liquid-solid interface. For such reactions a common ultrasonic cleaning bath will often be adequate. The low intensity available in these devices ( about one watt per square centimeter) can, however, prove to be a limitation. On the other hand, ultrasonic cleaning baths are easily accessible, comparatively inexpensive, and usable on moderately large scales. Finally, for large-scale irradiations, flow reactors with high ultrasonic intensities are commercially available in modular units as powerful as 20 kilowatts. The chemical effect of ultrasound on aqueous solutions have been studied for many years. The primary products are molecular hydrogen (H2) and hydrogen peroxide (H2O2). Other high-energy intermediates may include HO2 (superoxide), H· (atomic hydrogen), OH· (hydroxyl), and e-(aq) (solvated electrons). Peter Riesz and collaborators at the National Institutes of Health used electron paramagnetic resonance with chemical spin-traps to demonstrate definitively the generation of H· and OH· . 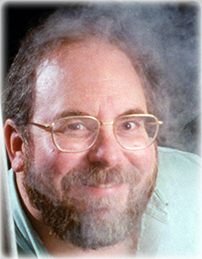 The extensive recent work in Arne Henglein's laboratory at the Hahn-Meitner Institute involving aqueous sonochemistry of dissolved gases has established analogies to combustion processes. As one would expect, the sonolysis of water, which produces both strong reductants and oxidants, is capable of causing secondary oxidation and reduction reactions, as often observed by Margulis and coworkers. In contrast, the ultrasonic irradiation of organic liquids has been little studied. Suslick and co-workers established that, as long as the total vapor pressure is low enough to allow effective bubble collapse, almost all organic liquids will generate free radicals (uncharged, reactive intermediates possessing an unpaired electron) when they undergo ultrasonic irradiation. The sonolysis of simple hydrocarbons creates the same kinds of products associated with very high temperature pyrolysis. Most of these products - H2, CH4 (methane), and the smaller 1-alkenes, derive from a well-understood radical chain mechanism. Relatively large amounts of acetylene (C2H2) are also produced, which is explained by the stability of this gas at very high temperatures. The sonochemistry of solutes dissolved in organic liquids also remains largely unexplored, though that of metal carbonyl compounds is an exception. In 1981, P. F. Schubert, J. W. Goodale and Suslick reported the first sonochemistry of discrete organometallic complexes and demonstrated the effects of ultrasound on metal carbonyls. Detailed studies of these systems led to important understandings of the nature of sonochemistry. Unusual reactivity patterns have been observed during ultrasonic irradiation, including novel metal cluster formation and the initiation of homogeneous catalysis at low ambient temperature, with rate enhancements greater than 100,000-fold. The effects of ultrasound on polymers (giant molecules formed by the coupling of small molecules-monomers) have been thoroughly studied over the past 30 years. The controlled cleavage of polymers in solutions irradiated with ultrasound has been examined in detail. Polymer degradation produces chains of smaller lengths with relatively uniform molecular weight distributions, with cleavage occurring primarily in the center of the polymer chain. Several mechanisms have been proposed for this sonochemical cleavage, which is usually described as a mechanical breakage of the chains induced by shock waves or solvent flow created by cavitation during the ultrasonic irradiation of liquids. This polymer fragmentation has been used by G. J. Price at the University of Bath to synthesize block copolymers of various sorts. Block copolymers are long chain polymers with two different, but linked, parts. As an analogy, imagine a train made up in front by passenger cars and in back by freight cars. In this fashion, block copolymers can do double-duty in their properties. Peter Kruus at Carleton University, Ottawa, reported the use of ultrasound to initiate polymerization in solutions of various monomers. Applications of ultrasound to the synthesis of biomaterials are under rapid development. While the chemical effects of ultrasound on aqueous solutions have been studied for many years, the development of aqueous sonochemistry for biomaterials synthesis is very recent. The area of protein microencapsulation has proved especially interesting. Microencapsulation, the enclosing of materials in capsules a few micrometers in size, has diverse important applications; these include uses with dyes, flavors and fragrances, as drug delivery systems, and as medical diagnostic agents. One recent example is the use of high intensity ultrasound to make aqueous suspensions of long-lived proteinaceous microspheres filled with air or with water-insoluble liquids for medical applications (Figure 9). 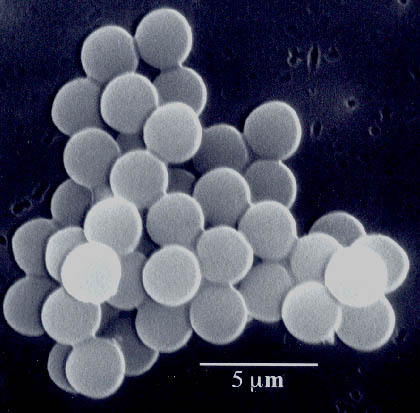 By itself, emulsification is insufficient to produce these long-lived microspheres; chemical reactions requiring oxygen are critical in forming them. Specifically, the sonolysis of water produces hydrogen atoms that react with oxygen to produce superoxide. Suslick and M. W. Grinstaff demonstrated that the proteinaceous microspheres are held together by disulfide bonds between protein cysteine residues and that superoxide is the cross-linking agent. Figure 9. Protein microspheres filled with the oily hydrocarbon dodecane were formed by the ultrasonic irradiation of albumin solutions. 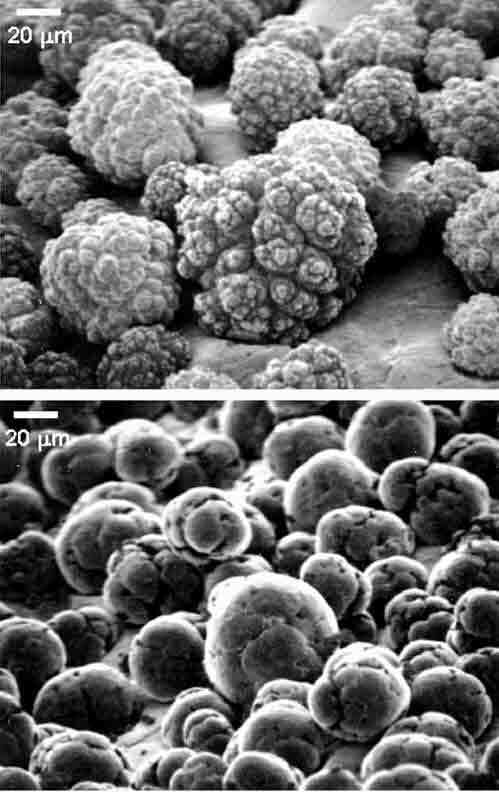 Such microspheres may prove useful for drug delivery and medical diagnostic imaging. A few years after the discovery of sonochemical reactions, H. Frenzel and H. Schultes in 1934 first observed sonoluminescence from water. As with sonochemistry, sonoluminescence derives from acoustic cavitation. Although sonoluminescence from aqueous solutions has been studied in some detail, only recently has significant work been reported on sonoluminescence from non-aqueous liquids containing no water. In both cases, the emission of light comes from the high temperature formation of reactive chemical species in electronic excited states. The emitted light from these excited states provides a spectroscopic probe of the cavitation event. High resolution sonoluminescence spectra from hydrocarbons and silicone oil were recently analyzed by Flint and Suslick. The observed emission comes from excited state diatomic carbon which are the same transitions responsible for the blue color of a hydrocarbon flame (from the kitchen stove, for example). The details of this emission depend on the temperature of the emitted C2 and can be accurately modeled with synthetic spectra as a function of presumed temperature. From a comparison of synthetic to observed spectra, the average effective temperature of the excited state of C2 is about 5,100 K, as mentioned above. Recently, it was discovered that sonoluminescence can be observed, quite remarkably, in a single, oscillating gas bubble. In 1990 E. Gaitan and L. A. Crum at the University of Mississippi discovered conditions under which a single, stable gas bubble could produce sonoluminescent emission on each acoustic cycle, and continue this process essentially indefinitely. Seth J. Putterman at the University of California Los Angeles examined these bubbles with a time resolution in picoseconds. 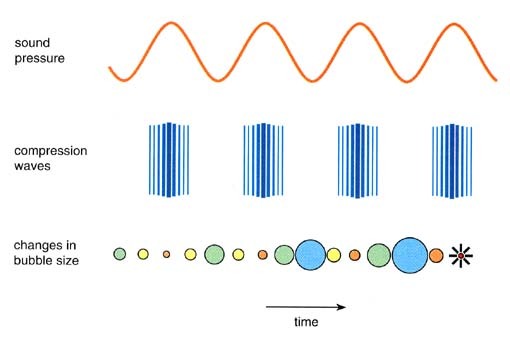 Gaitain, Crum, and Putterman were able to use sophisticated light scattering techniques to measure the radius-time curve of the luminescing bubble and to correlate the optical emissions with a particular phase of the sound field. As expected, the emissions occurred during cavity collapse. Quite surprisingly, the duration of the sonoluminescence emissions was less than a hundred picoseconds, roughly one millionth the duration of the acoustic cycle used. This very short emission appears to originate from the formation of shock waves within the collapsing bubble during the first stages of compression. The use of high-intensity ultrasound to enhance the reactivity of metals as stoichiometric reagents has become an important synthetic technique for many heterogeneous organic and organometallic reactions, especially those involving reactive metals, such as magnesium, lithium, and zinc. This development originated from the early work of Pierre Renaud in France in the 1950's and the more recent breakthroughs of J.-L. Luche at the University of Grenoble, France. This application of sonochemistry grew rapidly during the past decade in a large number of laboratories across the world. The effects are quite general and apply to reactive inorganic salts as well. Reactivity rate enhancements of more than 10-fold are common, yields are often substantially improved, and by-products avoided. 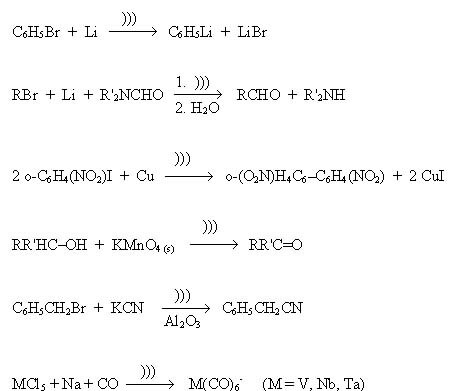 A few simple examples of the sonochemistry of reactive reagents are shown below (where ))) indicates ultrasonic irradiation), taken from the work of Takashi Ando, Philip Boudjouk, Luche, Timothy J. Mason, and Suslick, among others. The mechanism of the rate enhancements in reactions of metals has been unveiled by monitoring the effect of ultrasonic irradiation on the kinetics of the chemical reactivity of the solids, examining the effects of irradiation on surface structure and size distributions of powders and solids, and, determining depth profiles of the surface elemental composition. The power of this three-pronged approach has been proved in studies of the sonochemistry of transition metal powders. Doktycz and Suslick found that ultrasonic irradiation of liquids nickel, zinc, and copper powders leads to dramatic changes in structure. The high-velocity interparticle collisions produced in such slurries cause smoothing of individual particles (Figure 10) and agglomeration of particles into extended aggregates (Figure 8). Surface composition was probed by Auger electron spectroscopy and mass spectrometry to generate depth profiles of these powders; they revealed that ultrasonic irradiation effectively removed the inactive surface oxide coating. The removal of such passivating coatings dramatically improves reaction rates. Figure 10. The effect of ultrasonic irradiation on the surface texture of nickel powder. High-velocity interparticle collisions caused by ultrasonic irradiation of slurries is responsible for these effects. Considerably less work has been done on the activation of less reactive metals. This goal continues to attract major efforts in both synthetic organometallic chemistry and heterogeneous catalysis. Ultrasound can be used at room temperature and pressure to promote heterogeneous reactions that normally occur only under extreme conditions of hundreds of atmospheres and hundreds of degrees. 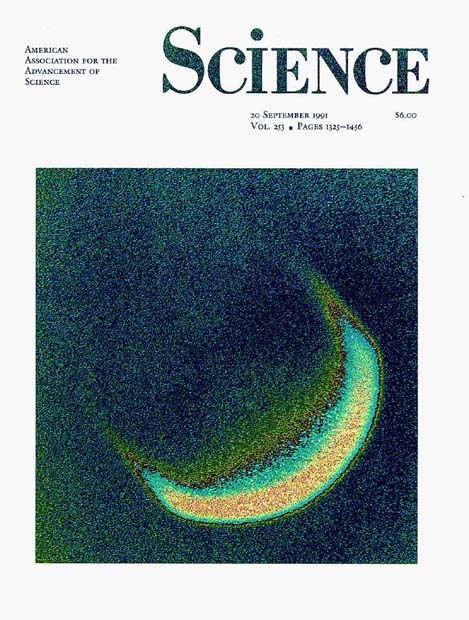 For example, R. E. Johnson and Suslick found good results with the use of ultrasound to drive some of the most difficult reactions known for transition metals: the attack of carbon monoxide on the very unreactive early transition metals such as vanadium, tantalum, molybdenum and tungsten. 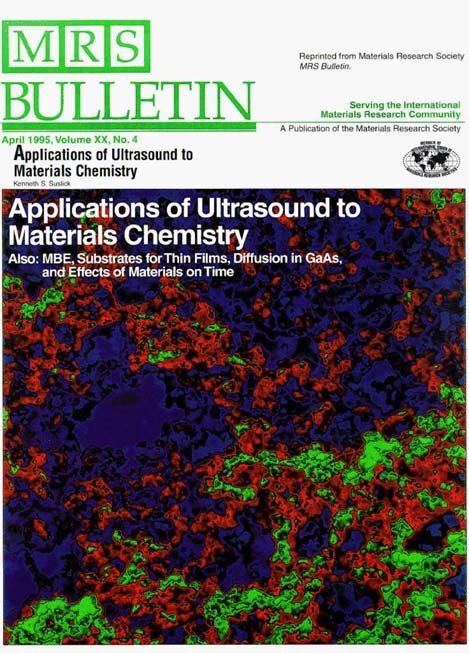 Another application of ultrasound in materials chemistry involves the process of intercalation, which is the adsorption of organic or inorganic compounds as guest molecules between the atomic sheets of layered solid hosts, such as graphite or molybdenum sulfide. Intercalation permits the systematic change of optical, electronic, and catalytic properties. Such materials have many technological applications (for example, lithium batteries, hydrodesulfurization catalysts, and solid lubricants). The kinetics of intercalation, however, are generally extremely slow, and syntheses usually require high temperatures and very long reaction times. M.L.H. Green at University of Oxford, Suslick and their students discovered that high-intensity ultrasound dramatically increases the rates of intercalation of a wide range of compounds (including amines, metallocenes, and metal sulfur clusters) into various layered inorganic solids such as ZrS2, V2O5, TaS2, MoS2, and MoO3. Scanning electron microscopy of the layered solids in conjunction with studies of chemical kinetics demonstrated that the origin of the observed rate enhancements comes from particle fragmentation (which dramatically increases surface areas), and to a lesser extent from surface damage. Because high-intensity ultrasound can rapidly form uniform dispersions of micrometer-sized powders of brittle materials, it is useful for a wide range of liquid-solid reactions. Another application of heterogeneous sonochemistry involves the preparation of amorphous metals. If one can cool a molten metal alloy quickly enough, it can be frozen into a solid before it has a chance to crystallize. Such amorphous metallic alloys lack long range crystalline order and have unique electronic, magnetic, and corrosion resistant properties. The production of amorphous metals, however, is difficult because extremely rapid cooling of molten metals is necessary to prevent crystallization. Cooling rates of approximately 106 K per second are required; for comparison, plunging red hot steel into water produces cooling at only about 2500 K per second. Very recently, the use of ultrasound to synthesize amorphous metal powders by using the sonochemical decomposition of volatile organometallics was reported by Suslick, S.-B. Choe, A. A. Cichowlas, and M. W. Grinstaff. This exciting discovery opens new applications of ultrasound for the low temperature synthesis of unusual phases. For example, the sonolysis of iron pentacarbonyl produces nearly pure amorphous iron, which was characterized by a variety of techniques to prove its lack of long-range order. Scanning electron micrographs show conchoidal fractures (those with smoothly curved surfaces, which are typical of an amorphous material), and at higher magnification reveals a coral-like porosity coming from the agglomeration of small clusters of iron (Figures 11 and 12). Figure 11. Amorphous iron powder is formed from the ultrasonic irradiation of iron carbonyl. The micrograph shows the porous, coral-like structure formed from nanometer-sized clusters created during acoustic cavitation. The amorphous iron is an extremely soft ferromagnetic material with high catalytic activity. The heating and cooling produced by cavitation are so rapid that the iron atoms cluster and solidify before they can form a well-ordered crystal. Figure 12. 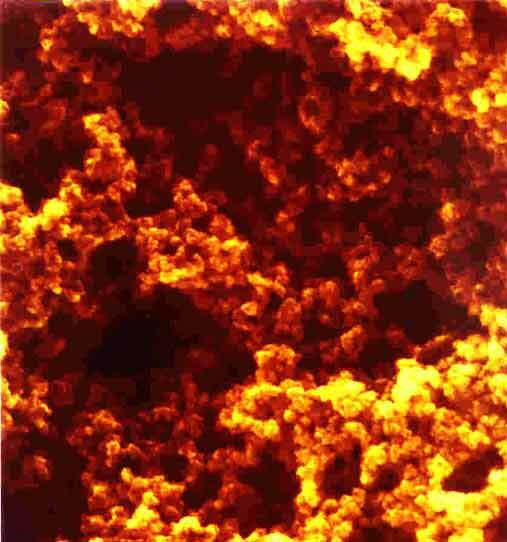 A transmission electron micrograph of amorphous iron powder, in false-color to enhance contrast. Because of their excellent magnetic properties, amorphous metals have important technological applications; these can include electrical transformer cores and magnetic tape recorder heads.Magnification of the cover image is approximately 100,000. The sonochemically synthesized amorphous powders may have important technological applications. For example, the amorphous iron powder is an active catalyst for several important reactions, including the synthesis of liquid fuels from CO and H2 (which can be produced from coal). In addition, magnetic measurements reveal the amorphous iron to be a very soft ferromagnet, that is, a material that very quickly forgets its magnetization once an magnetic field has been turned off. While such materials would be very bad for making permanent magnets, they are very good for making magnetic shielding, electrical transformer cores, or magnetic media recording heads. Catalytic reactions are of enormous importance in both laboratory and industrial applications. Catalysts increase the rates of chemical reactions without being consumed themselves; they are generally divided into two types. If the catalyst is a molecular or ionic species dissolved in a liquid, then the system is "homogeneous"; if the catalyst is a solid, with the reactants either in a percolating liquid or gas, then it is "heterogeneous." In both cases, it is often a difficult problem either to activate the catalyst or to keep it active. Ultrasound has potentially important applications in both homogeneous and heterogeneous catalytic systems. Heterogeneous catalysis is generally more industrially important than homogeneous systems. For example, virtually all of the petroleum industry is based on a series of catalytic transformations. Heterogeneous catalysts often require rare and expensive metals. The catalytic converters used on automobiles to lessen pollution, for example, use platinum or rhodium, which are enormously expensive; rhodium costs about $1500 dollars per ounce! Using ultrasound offers some hope of activating less reactive, but also less costly, metals. Some early investigations of the effects of ultrasound on heterogeneous catalysis can be found in the Soviet literature. In this early work, increases in turnover rates were usually observed upon ultrasonic irradiation, but were rarely more than 10-fold. In the case of modest rate increases, it appears likely that the cause is increased effective surface area; this is especially important in the case of catalysts supported on brittle solids. More impressive accelerations, however, have been recently reported, including hydrogenations (catalytic reactions of hydrogen with unsaturated organic compounds) by nickel, palladium, or platinum. For example, D. J. Casadonte and Suslick discovered that hydrogenation of alkenes by nickel powder is enormously enhanced (about 100,000-fold) by ultrasonic irradiation. A very interesting effect on the surface morphology was observed (Figure 10). Ultrasonic irradiation smoothes, at a macroscopic scale, the initially crystalline surface and causes agglomeration of small particles. Both effects are probably due to interparticle collisions caused by cavitation-induced shock waves. Auger electron spectroscopy reveals that there is a considerable decrease in the thickness of the oxide coat after ultrasonic irradiation. The removal of this layer is probably responsible for the great increase observed in catalytic activity. Acoustic cavitation results in an enormous concentration of energy. If the energy density in an acoustic field that produces cavitation is compared with that in the collapsed cavitation bubble, there is an amplification of almost one trillion. The enormous local temperatures and pressures of cavitation result in sonochemistry and sonoluminescence. 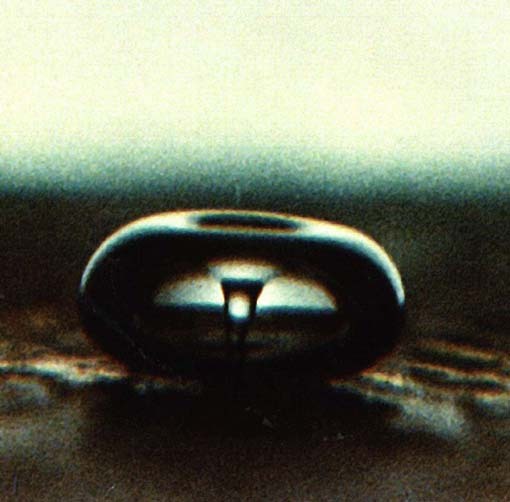 Cavitation produces an unusual method for fundamental studies of chemistry and physics under extreme conditions, and sonochemistry provides a unique interaction of energy and matter. In addition, ultrasound is well suited to industrial applications. Since the reaction liquid itself carries the sound, there is no barrier to its use with large volumes. In fact, ultrasound is already heavily used industrially for the physical processing of liquids, such as emulsification, solvent degassing, solid dispersion, and sol formation. It is also extremely important in solids processing, including cutting, welding, cleaning, and precipitation. The extension of ultrasound to the chemical processing of liquids is underway. The future uses of ultrasound to drive chemical reactions will be diverse. It is becoming a common tool in nearly any case where a liquid and a solid must react. In the synthesis of pharmaceuticals, for example, ultrasound may permit improved yields and facilitate reactions run on larger scale. In the development and use of catalysts, ultrasound also has potential applications. Its ability to create highly reactive surfaces and thereby increase their catalytic activity has only just now been established. Ultrasound can produce materials with unusual properties. The extraordinary temperatures and pressures reached during cavitational collapse, combined with the exceptionally high rates of cooling, may allow researchers to synthesize novel solid phases difficult to prepare in other ways. One may be optimistic that the unusual reactivities caused by ultrasound will find important industrial application in the years to come.